May i buy moss please? I know this is a pretty old journal but.. is moss still open? Is TBN still available for sale? Ooo, okay! Sure, I'd love to! alright, i'll note you my paypal! okay i got the money! could i buy lexi? edit: wait.. you got the chimereon for $37. is it okay if i buy it for $37? no wait, XanderGirl96 the rules for chimereons say that you cant sell them for higher than what you bought them for. Users are bound by the TOS at the time they purchase/adopt/sell their Chimereon. Chimereons can be purchased primarily through adoptions either through an auction or a flat-sale. 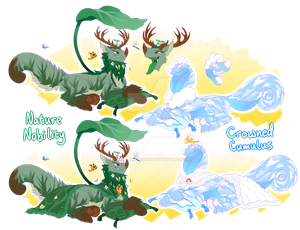 Chimereons may also be attainable through DTA's(Draw to Adopt), MYO's(Make Your Own), or other events. Create a name/personality for them. Dictate who can draw your Chimereon and how they are to be portrayed. Make minor changes to your chimereon that do not conflict with the rarity or too strongly alter the original design. Claim Chimereons as your own species nor claim the design as your own unless it is a MYO design. Use Chimereons for monetary purposes. Trade or recreate Chimereons for public use or sale. All purchases are to be made through Paypal and with USD. wait i don't think you registered them on the chimereon masterlist, but that's okay! could you send lexi over? i sent the money! OH Hhhh thank you so much!!! this is my first chimereon and i just loved her design. wait, before that, could you link me to her masterlist entry? then i can do $40, i really want her! could i have lexi on hold? i currently have $20, and i'll get the last $20 sometime this week. just this week ! because i have two people who are going to give me money this week. Do you know how long though ? I usually don’t dont holds longer than 24 hours because of being burned in the past. its going to be longer than 24 hours, so i'll just come back when i get the money! I know they're listed as hard, but would you be interested in selling Reli or Mama Leone for their gatcha price? Apologies. Thank you for getting back to me. well good luck w your rent! I just got a quick question about your tags. Some chams got nfs, but also hard. Does that mean you take offers on them? Who were you interested in though?